Select kiwifruits that are unblemished and firm but not rock hard. The flesh should yield to gentle pressure, similar to that of a ripe peach. Avoid those that are shriveled, moldy or have soft spots. You can easily ripen kiwifruit by leaving it at room temperature for a few days or to speed up the process, put the kiwifruit in a dry paper bag along with an apple or banana. If the whole uncut fruit is refrigerated in a plastic bag with a few small holes, maintaining a 95 percent humidity level, it can actually last up to 6 months. However, for home usage, it is best to use them within 1 week. The fruit may be frozen by peeling and covering with a heavy sugar syrup to which has been added 1/2 teaspoon of ascorbic acid per quart of liquid. Frozen kiwifruit may be stored 10 to 12 months at 0 degrees F.
Kiwifruit may look unpalatable at first glance, but beneath that hairy brown exterior lies emerald green flesh with a flavor reminiscent of to some and pineapple to others. As tempting as it is in, this sweet, yet slightly tart fruit also works well in savory dishes. 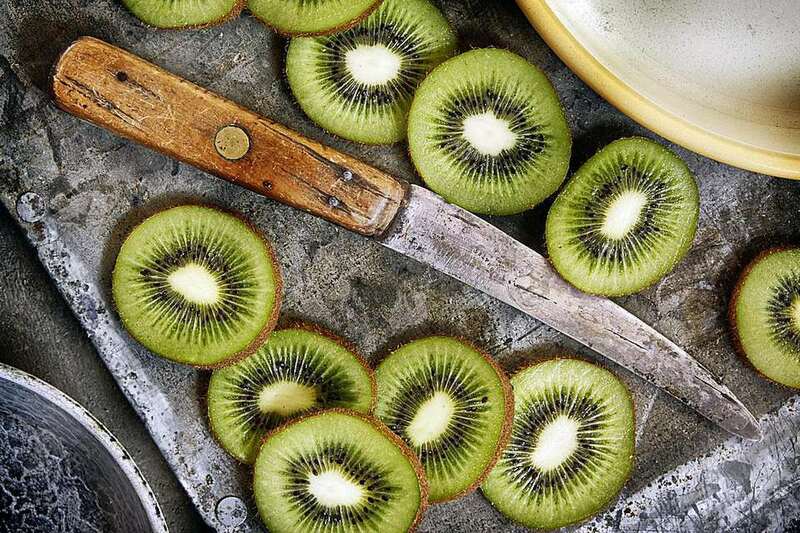 Most people prefer to either peel kiwifruit or slice in half and scoop out the flesh with a spoon. However, there are some varieties that are scarcely hairy at all, and these may be eaten skin and all if you are feeling adventurous. An egg-slicer may be used to slice peeled kiwifruit into uniform slices for recipes or as a colorful garnish. Kiwifruit does not work well in gelatins, due to an enzyme which breaks down collagen. However, this same enzyme also makes it a great tenderizer for meat. This enzyme will also curdle milk (but not heavy cream), so you may wish to briefly cook the fruit to deactivate the enzyme when using with dairy products. Kiwifruits are low in fat and calories and have no cholesterol. They are loaded with Vitamin C, potassium and fiber, making it one of nature's tastiest superfoods.